I LOVE this time of year. Everywhere you look there are all sorts of amazing holiday recipes and I can get sucked into Pinterest for hours looking at Thanksgiving recipes. The problem is when it comes to making the Thanksgiving dinner menu everyone has their favorite traditional Thanksgiving side or Thanksgiving dessert and no one wants to give them up so we can try something new. I’m just as guilty as everyone else. I mean it wouldn’t be Thanksgiving without my grandma’s Broccoli Casserole! This year I’ve found at least one recipe that everyone is excited to try. 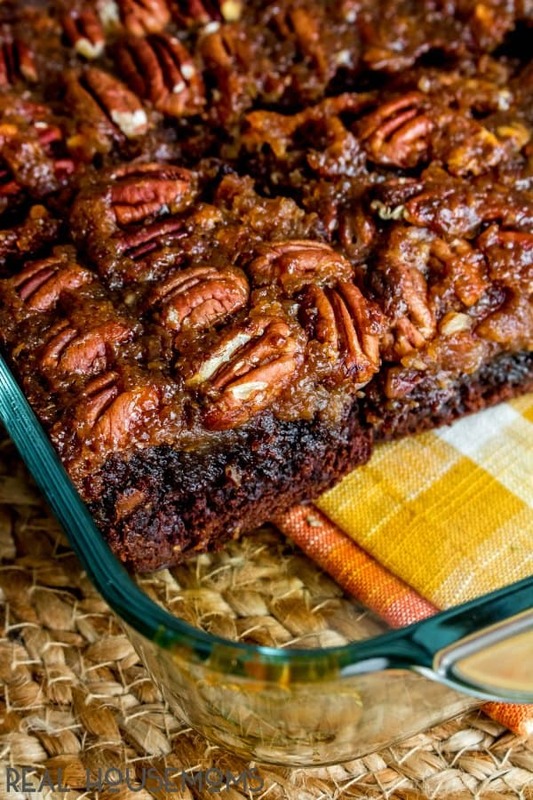 These rich, fudgy Pecan Pie Brownies combine two Thanksgiving classics into one decadent Thanksgiving dessert. Pecan Pie is a must on Thanksgiving. I’ve tried switching it up and my Pecan Pie Cake Roll was a hit so this year I thought I’d see if I could do it again. 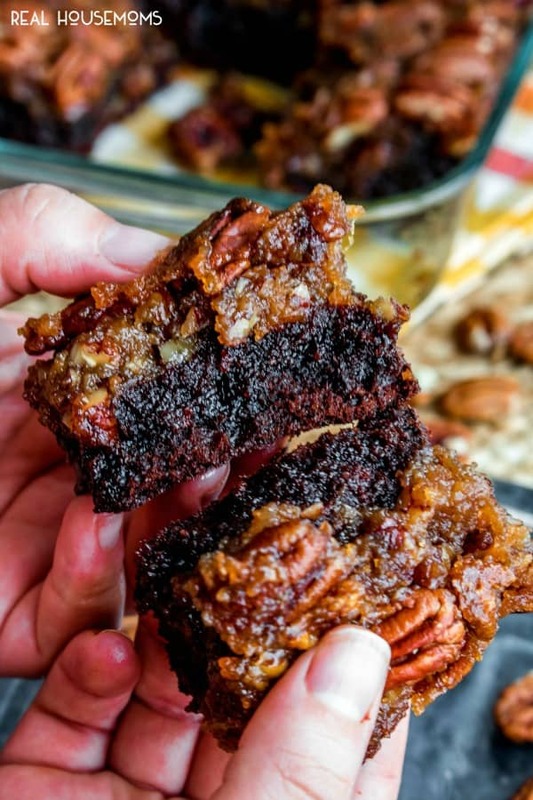 These Pecan Pie Brownies take everyone’s favorite part of the pecan pie, the gooey, nutty filling, and bake it right on top of rich chocolate brownies. 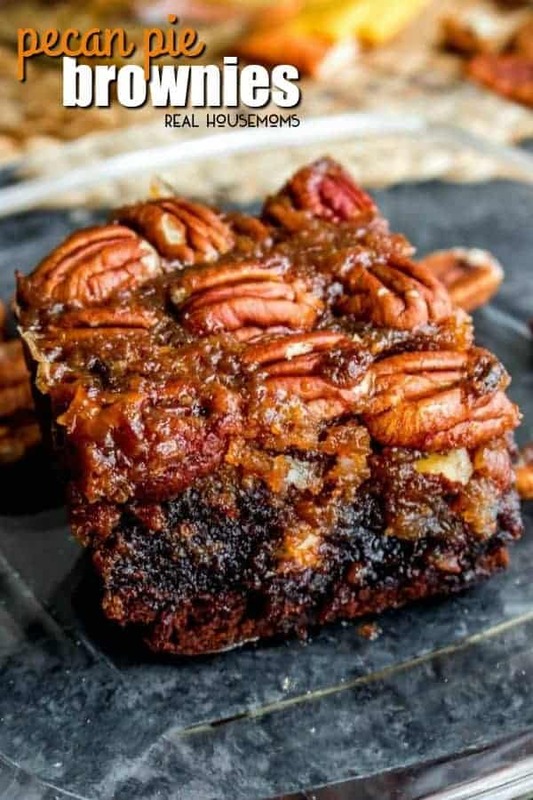 I’m gonna be honest, while everyone else in the family can’t live without pecan pie it’s not my favorite dessert, but these brownies were out of this world good! The combination of chocolate and pecan pie filling is so much better than plain old pecan pie. It’s a simple recipe. I used a boxed brownie mix (one that makes a 13-inch x 9-inch pan of brownies) to keep things simple but if you have a favorite brownie recipe you can use that. I made the pecan filling using the same recipe my mom uses for pecan pie. I mixed up the brownies, poured them into my brownie pan, and baked them for 20 minutes. While they baked I mixed together the ingredients for my pecan pie filling. After 20 minutes I removed the partially cooked brownies from the oven and poured the pecan pie filling over them. Then everything went back into the oven and baked for another 30-40 minutes. I’ve got to tell you the kitchen smelled pretty amazing and when those Pecan Pie Brownies came out of the oven it took all of my willpower not to dive right in.It was worth the wait though and when the brownies had cooled I cut a few slices and all of my taste testers agreed that they were awesome enough to make it onto this year’s Thanksgiving dessert menu! Pour brownie batter into a greased 13x9 inch pan and place in oven to bake for 25-30 minutes. While the brownies bake combine the sugar, corn syrup, eggs, butter, and vanilla in a bowl. Mix together thoroughly. After 25-30 minutes remove the brownies from the oven and pour the pecan pie filling over them. Place them back in the oven and bake for 30-40 minutes or until the filling only jiggle slightly in the middle when you move the pan. If you can't find family-size brownie mix boxes, you can use 2 regular size brownie mix boxes. The cooking times are different between your blog and the recipe. The blog has 20 minutes for brownie then 45-55 minutes to finish. The recipe has 10 and then 35-45 to finish. Can you tell me which to follow? I’d really like to try theese. Hi Marsha! Sorry for the confusion. The post has been updated, it is 10 minutes and then 35-45 to finish. Its definitely not 10! I am making these right now and when I poured the filling in it just sank 🙁 Crossing my fingers my Thanksgiving dessert isn’t ruined! I just made a batch of the brownies. 3. I’m thinking baking the brownies for 20 minutes is correct. I followed the recipe and baked the brownies for 10 minutes and poured on the pecan mixture. The brownie batter was still pretty runny so the pecan mixture didn’t stay on top. I’m sure they will taste delicious but the brownie/pecan pie layers won’t look as they do in the photo. P.S. After adding the pecan mixture I baked for 30 minutes. Like the idea of the Bourbon Will try this! Apparently it’s 20 minutes because pecan mixture ended up on bottom. I cooked my brownies for 20 minutes, then an additional 30 minutes after topping was put on. Pour pecan pie filling after brownies were in oven for 10 minutes and it all sunk into the brownies. They are ruined, so in think the brownies need to be in for 20 minutes before pie filling goes on. I was very disappointed. Recipe does not say what size brownie mix. Hi Benna! This recipe uses the big family size box (for 13×9 pan). You could also use 2 regular brownie mix boxes to fill the larger pan. Thank you for bringing this to our attention. We’ve updated the recipe card to reflect this note. A regular box does make a 9×13. I used two brownie mixes because it said to use a 40 ounce box. Thought the brownies would just be thicker. They didn’t turn out. I was very disappointed. The recipe calls for chopped pecans, but I noticed your brownies look much prettier, looks like whole pecans on yours. Mine turned out delicious, but just not as attractive, did you use whole pecans??? The recipe calls for chopped pecans to be mixed in, but for decorative purposes you’re welcome to add whole or very roughly chopped pecans on top. When do you put the whole pecans on top? Before or after cooking!? I would recommend before but it’s truly up to preference. If you prefer your pecans to be crunchy then after. Can you tell me what brand and kind of brownie mix you use? Thank you! Unfortunately there is not a particular brand we use, it’s whatever looks good at the store that day or might be on sale! Pick your favorite and have fun!!! They look great, but when you pour the pecan and egg mixture over the hot brownies, some of the egg cooks as it hits the heat of the brownies and looks like cooked eggs. Eggs need to be tempered. So maybe the pecan mixture should be added at the same time and cook together. I used 30 minutes total. But will do differently next time baking all at once. How did they turn out for those of you that it mixed. Mine mixed all together as well and are still baking. Is it a loss? Oh darn, I’m sorry for that inconvenience I thought the correction was saved. I just double checked it and it has been updated so hopefully no future issues occur. I hope they turned out great! No, it is not. Look at this link, a family size box is slightly less than 20oz. https://goo.gl/images/VWQLX2 This recipe has some flaws based on all the comments. Is it 4 eggs total or 4 eggs just in the mixture that goes on top of the batter?? It will be 4 eggs for the topping mixture, the batter is mixed separately per the ingredients on the box. OK. I am really confused. You say a 40 oz box of brownie mix OR (2) boxes of regualr size brownie mix. I used 2 boxes but the batter is really thick. Since I used (2) boxes should I have used double the ingredients?? Yes, you would use the correct amount of ingredients for whichever size boxes you chose. If you used 2 boxes you would follow the ingredients for both boxes. Glad to hear!! Thank you. I cut the recipe in 1/2 and baked brownies according to directions except careful not to overlook. Poured mixture on top and baked until kind of firm on top, about 35 minutes. Came out perfect. Thank you. I wish you would have said wether to use light or dark corn syrup. Quite honestly you can use whichever you prefer. While light is typically used a delicately sweet flavor is desired, such as in fruit sauces and jams and dark has a more robust flavor and color, it is ideal for many baked goods. Keep in mind these are on the rich side so it’s left up to you to decide. These sound delicious but with all the sugar and carbs we can’t eat them. One of us is diabetic and other one comes from a family of diabetics. Made these,followed your corrected instructions, and they are awesome! Thank you!! Wish I knew how to post a photo—they looked so good. I am taking them as a gift for my daughter’s anniversary. I’m so happy to hear that!! Thank you. I made sure I read the instructions very carefully then I came and read the comments. I find it to my benefit and I’m glad I did! I ended up cooking the brownies for 35 minutes. Then I tempered the eggs and butter (right after the butter was melted), that way the eggs wouldn’t cook when I pour it over the hot brownies. I put it all back into the oven for 30 minutes and it cooked perfectly. I feel like oven temperature can be off, a separate thermometer in the oven is best. these came out perfect. I let them cool for a couple hours before cutting into them. Thank you for the recipe! Thank you so much, it’s wonderful to know that the comments were so helpful. Can u plz confirm the brownie mix. My box says family size 13*9 and it is not 40oz? Did you use one 40oz box or two regular boxes for your brownie mix part, and what mix did you use? Baked for 20 min and then poured the pecan mixture on top. It all sank to the bottom ? So is it supposed to be ONE family size box of brownie mix? They are 19oz and fill up a 9×13 pan OR is It the 40oz? Seems very runny after baking 20 min. Hope they turn out! I made this recipe today and it was a disaster. The pecan filling absorbed and sunk into the brownies. Aside from being a gooey mess, it tasted awful. I used Ghirardelli Brownie mix which is usually everyone’s favorite. The pecan pie filling changed the chocolate flavor and the brownie tasted “off”. I threw them out. The filling was not a good taste and putting it on top of the brownie turned it into an awful tasting mess. This recipe was AWFUL. As everyone has already stated, the brownies did not cook all the way through. The pecans sank to the bottom. I was left with soup that no one could eat. This was a $30 grocery trip I could have definitely done without. What kind of corn syrup did you use? Dark or light? Plan on making these for Thanksgiving!! Quite honestly you can use whichever you prefer. While light is typically used when a delicately sweet flavor is desired, such as in fruit sauces and jams and dark has a more robust flavor and color, it is ideal for many baked goods. Keep in mind these are on the rich side so it’s left up to you to decide. These look delicious! I’m going to make them for thanksgiving!! Just to clarify, this recipe calls for 4 eggs in addition to the eggs that the brownie mix calls for? So if the family size brownie mix calls for 4 eggs, I will need 8 eggs total? You will mix the brownie mix as instructed per the box, then you will use the other 4 eggs listed for the pecan topping. Hope that helps to clear that up. Thank you. I tried this recipe out last night for Thanksgiving – followed everything exactly, but it looked a bit runny when I took it out. I hoped it just needed to cool and would firm up after a few hours, but it didn’t. I put it back in for about a half hour and it got a bit better, but still not firm at all. I cut into it and found the brownies hadn’t even cooked, and the pecan mixture was seeping into it. I ended up having to cook it for another hour or so for it to even resemble brownies. They still ended up tasting really good, but the cooking times were way off – I probably ended up cooking them for somewhere around 3-4 hours altogether. I’d make it again, but would definitely have to change the timing a bit! I followed the recipe exactly and it was ruined. The pecan mix sank to the bottom and it all turned into soup. I am so upset. These are very poor instructions. I poured the pie filling over the brownies after 35 minutes in the oven and it sunk through. The brownies are completely ruined. Please update the cooktime on these so this can be a usable recipe. I read the comments before I attempted this recipe- and it came out AWESOME. I used ONE family size Betty Crocker dark chocolate brownie mix (I think it was about 19.9 ounces) in a 13×9 glass pan. They didn’t come out as thick as the pictures this way, but they were at least fully cooked. I used butter to coat the sides, but it was still pretty sticky. I would probably use parchment paper next time. I also used pecan halves and chopped them myself instead of buying the pre-chopped pecans. They came out bigger this way, and looked nicer on top. I followed the rest of the directions precisely, making sure the brownies were pretty much fully cooked (30 minutes in the oven) before I poured the pecan pie mix on top. I also let the brownies cool for about 30 minutes before I poured the filling over, to prevent the eggs from cooking on top of the brownie (it worked). I put it back in the oven for 40 minutes. Make sure you let it cool completely before consuming, it holds it’s shape much better when cooled. Thank you. Yours was the most helpful comment. The recipe printed on this page is pretty awful. No such thing as a 40-oz. brownie mix. I will use one family size mix , 18.2 oz, let brownie mixture cool before adding pecan pie mixture, and hope for the best. Because the posted recipe was so unclear, I won’t look for more recipes here. Very disappointed. I also used 2- 20 ounce packages. And center was NOT COOKED! Please recheck you recipe before posting to make sure everything is correct. Pecans are VERY expensive!!! Will never look for a recipe on this site again. Made these and they are delicious! This a great way to dress up your regular brownies.